Get Toto and go to the cellar! This has been an unusually wet summer in Sask, with lots of thunderstorms, cloud cover, and high humidity. I really like it, thought it has been trouble in some parts of the province where they have had >150mm in a day, causing major flooding and road closures and general chaos. Here I thought Saskatchewan could be a haven for climate refugees, but looks like our weather will also be crazy(ier). 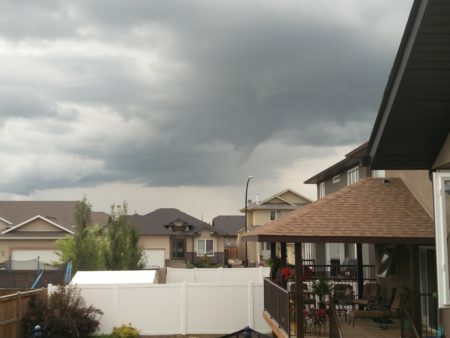 The stormy weather has brought a few funnel clouds, which are like ‘tornado light‘. I took this photo above last weekend at a friend’s. You can see the start of the dark grey funnel cloud like a cylinder or tail reaching down towards the ground. Time to kick back and enjoy the show with a drink!